Drivin Me Batty wildlife control is a professional trapping and prevention company specializing in the humane capture and relocation of nuisance animal pest through out Michigan. Woodchucks can cause many problems from their digging and burrows, although small they can be an aggressive animals if cornered and will defend themselves. Their large teeth and claws can cause serious harm to animals or humans that may come in contact with them. 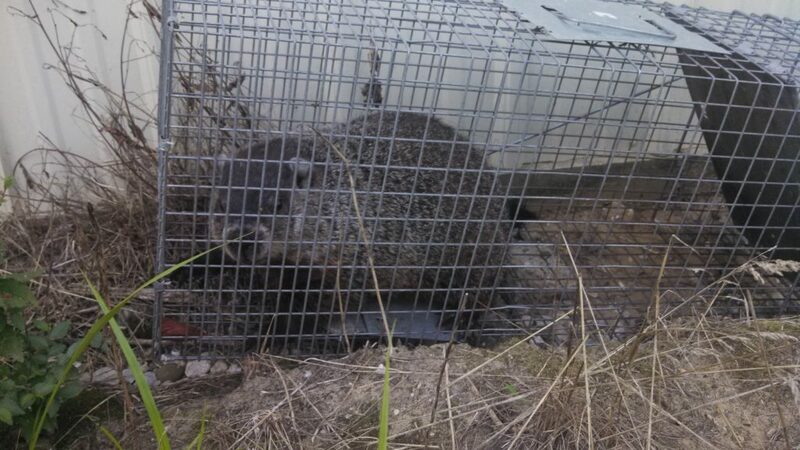 Call Drivin Me Batty for woodchuck trapping and groundhog removal to keep your home, business, or office safe from harms way. The groundhog (Marmota monax), also known as a woodchuck, whistle-pig, or in some areas as a land-beaver, is a rodent of the family Sciuridae, belonging to the group of large ground squirrels known as marmots. The woodchuck is a lowland creature. It is widely distributed in North America and common in the northeastern and central United States. Groundhogs are well adapted for digging, with short but powerful limbs and curved, thick claws. Unlike other sciurids, the groundhog’s spine is curved, more like that of a mole, and the tail is comparably shorter as well—only about one-fourth of body length. Suited to their temperate habitat, groundhogs are covered with two coats of fur: a dense grey undercoat and a longer coat of banded guard hairs that gives the groundhog its distinctive “frosted” appearance. In the wild, groundhogs can live up to six years, with two or three being average. In captivity, groundhogs are reported to live from 9–14 years. Common predators for groundhogs include wolves, coyotes, foxes, bobcats, bears, large hawks, and dogs. Young groundhogs are often at risk for predation by snakes, which easily enter the burrow. Usually groundhogs breed in their second year, but a small proportion may breed in their first. The breeding season extends from early March to mid- or late April, after hibernation. A mated pair remains in the same den throughout the 31–32 day gestation period. Groundhogs are excellent burrowers, using burrows for sleeping, rearing young, and hibernating. Though groundhogs are the most solitary of the marmots, several individuals may occupy the same burrow. Groundhog burrows usually have two to five entrances, providing groundhogs their primary means of escape from predators. Burrows are particularly large, with up to 46 ft of tunnels buried up to 5 ft underground, and can pose a serious threat to agricultural and residential development by damaging farm machinery and even undermining building foundations.